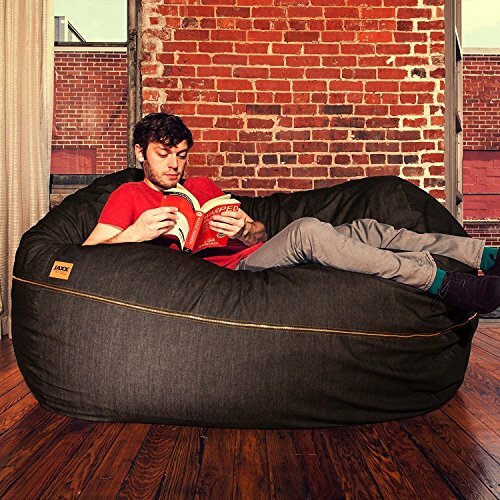 The Jaxx 5.5 ft Bean Bag is the cure for the common loveseat. It makes a statement as the centerpiece to a room or nestled into a corner. Not to mention it is heaven to lie back and relax on, with extra space in case you need room for two. Filled with finely shredded polyurethane foam and covered in soft yet durable Cone Denim, this stylish bean bag conforms to your body in a variety of position. Our Denim cover is both removable and machine-washable and is accented with a brass YKK zipper. Each bean bag includes a protective inner-liner with childproof zipper that keeps the filling out of reach when cleaning the cover. To clean the cover, wash with cold water and tumble dry on low heat. Fluff as needed.